Media and Contents: Hard cover; 200 pages plus covers; high quality glossy presentation in portrait 8.5” x11” format; four colour profiles; four colour photographs; one colour reproduction of Flack portrait; documents and victory list; abundant historical photos. Advantages: Interesting autobiography of one of the Luftwaffe's most significant personnel from his birth to the present day; good coverage of Falck's direct wartime experiences; beautifully reproduced photographs from his personal collection; attractive colour profiles by Tom Tullis. Wolfgang Falck was one of the most influential serving Luftwaffe Officers of the Second World War, with his initial success in Zerstorers, followed by his pioneering work on Night Fighter operations and tactics. He was quite rightly known as the Father of the Night Fighters. This new book from Eagle Editions is Wolfgang Falck's autobiography, finally written now that the author is in his nineties. As Falck himself points out, he is one of the few Germans to have seen through almost the whole tumultuous twentieth century, being born in the era of the Kaiser before the beginning of the First World War, receiving his education in a Naval school with ambitions of becoming an Officer in a new German Navy before joining the Army and immediately being thrust unexpectedly in the direction of the new, secret air arm. His time training in Russia, his early career back in Germany, and his travels in the late 1930s (including a trip to England in 1938 during which he made many English friends and made a good impression on the British press) are also covered. In fact, his nickname "The Happy Falcon" was bestowed upon Falck by a British journalist. Early wartime Zertorer operations in Poland, including Falck's high-profile first victory and his involvement in the crucial air Battle of Heligoland Bight are described in detail. Not surprisingly, the bulk of the remaining text is devoted to Night Fighter operations - specifically Falck's pivotal involvement in organisation, strategy, command and control. Falck's post-war career is also described. The ex-Luftwaffe Colonel found himself in the unlikely employ of the British Occupation Force; then as a representative of a Pharmaceutical Company; next moving through the ranks of a playing card company and finally returning to the aviation industry as representative first to North American Aviation, then McDonnell-Douglas. 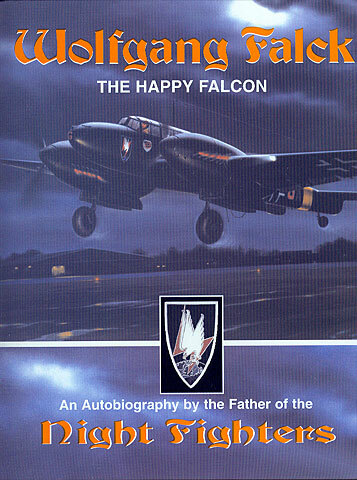 "The Happy Falcon" is an attractively packaged production of Wolfgang Falck's life story, told in his own words. This book will be of great interest to Luftwaffe historians and WWII aviation buffs.